I'm currently sitting in LAX airport, waiting to clear out of this amazing place. I fell pretty hard for Southern California and I saw it from Huntington Beach to the Malibu County line. I noticed a lot of characteristics of people in this area, most a lot more profound than this one; they love to describe food as 'bowls'. Acai Bowls, granola bowls, yogurt bowls. I think that this is interesting because a few years ago these foods would have been on the menu, just without the bowl description. Somehow...the receptacle that food would normally just sit in, has been morphed into a descriptor, transforming the food into the hippest, newest take on fresh ingredients. 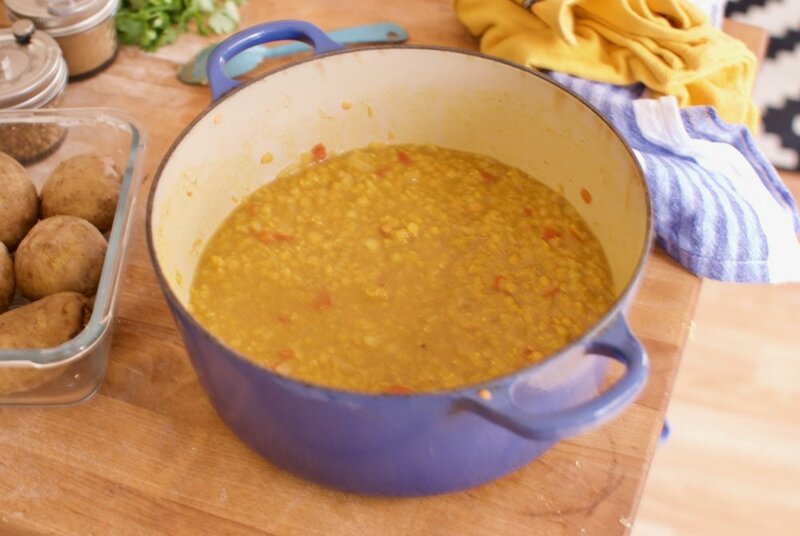 So I've decided to describe this red lentil dahl as a dahl and brown rice bowl, and presto, it's fit for an Abbot Kinney Vegan bistro teeming with celebs. Anywho, this is deffo the easiest one-pot recipe that I go back to again and again. It's flavor is dense, creamy and rich. 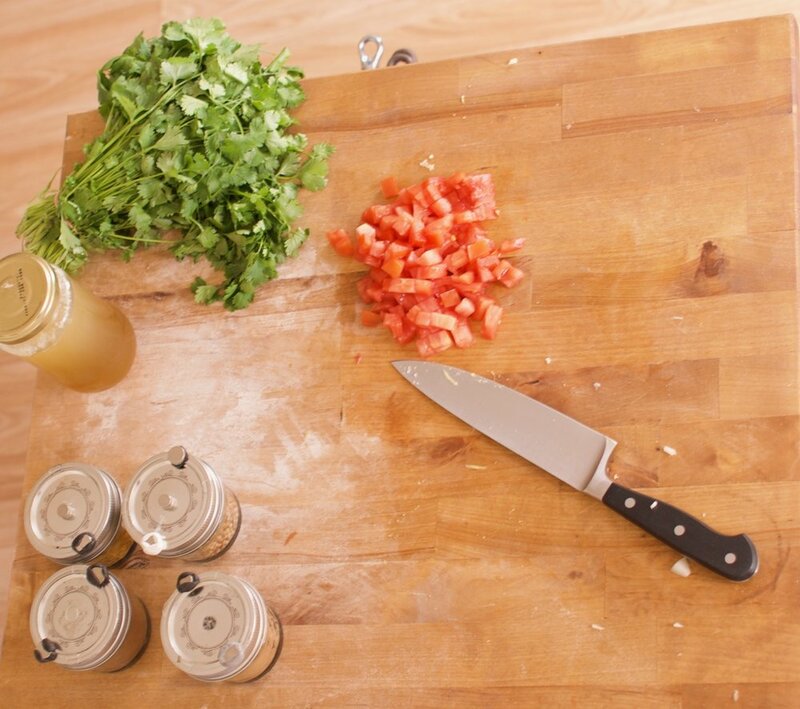 It lets you layer flavor on flavor, allowing each to shine. 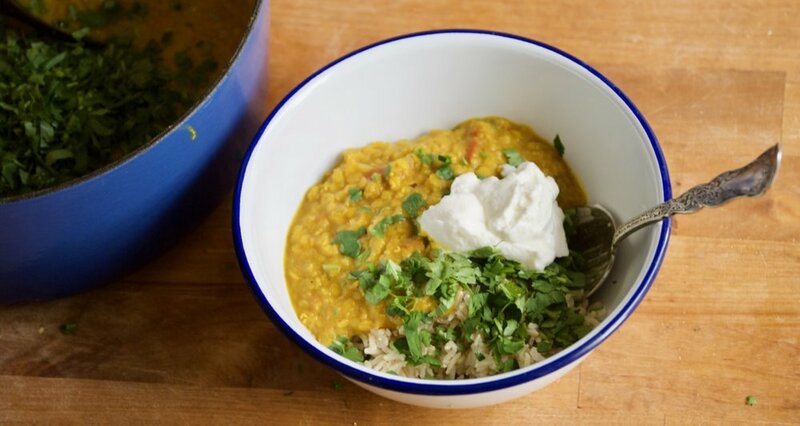 I think this dahl does indeed lend itself to being called a bowl because of the endless possibilities. My simple version is brown rice, cilantro and yogurt, two additions to that can be garlic sautéed chard and frizzled shallots. I also like yogurt, cilantro and piece of grilled meat or kofta. Garlic sourdough, wilted spinach and pickled lemon is a variation on a theme. White bean mash as a another base. The list goes on and on. 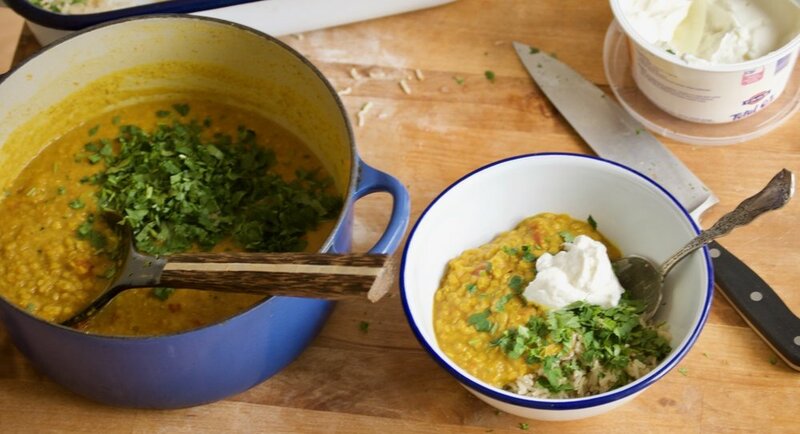 The dahl carries just another of a zingy curry flavor to stand up to all these ingredients without over-powering them as a tikka masala would. I've got the California bug. So from now on, everything has to either go in a bowl, be a "small plate", or fit in a smoothie. No exceptions! 2 cups red lentils, washed and soaked in warm water for 2-4 hours. 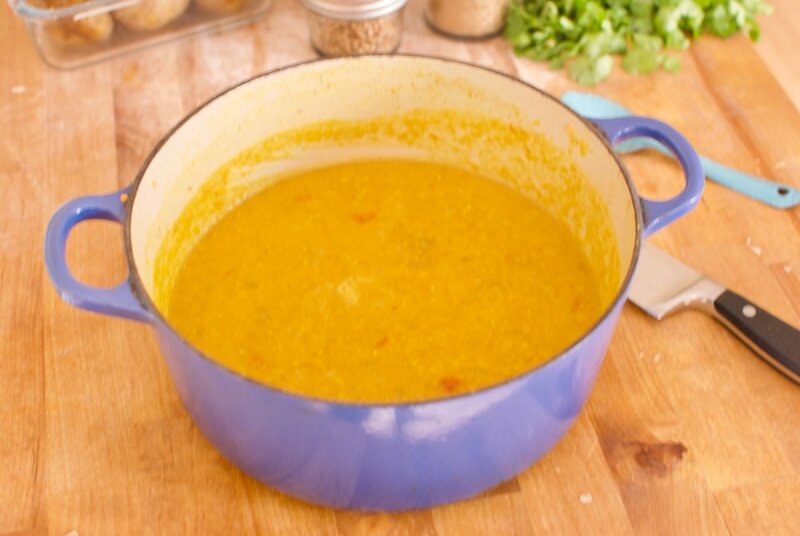 Soak the lentils in warm water, after shaking your hand through the lentils and rinsing them a few times. 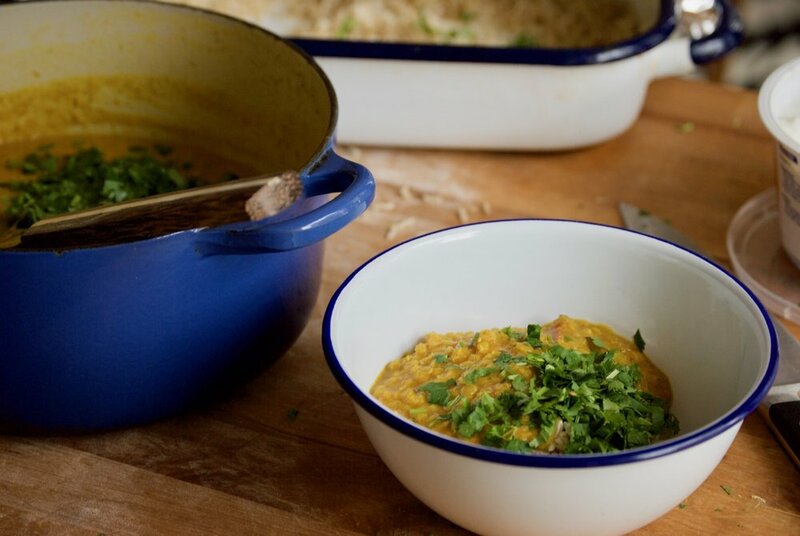 While the lentils soak, toast the caraway seeds and coriander seeds, then grind them either in a coffee grinder or a mortar, mix with the garam masala and turmeric. 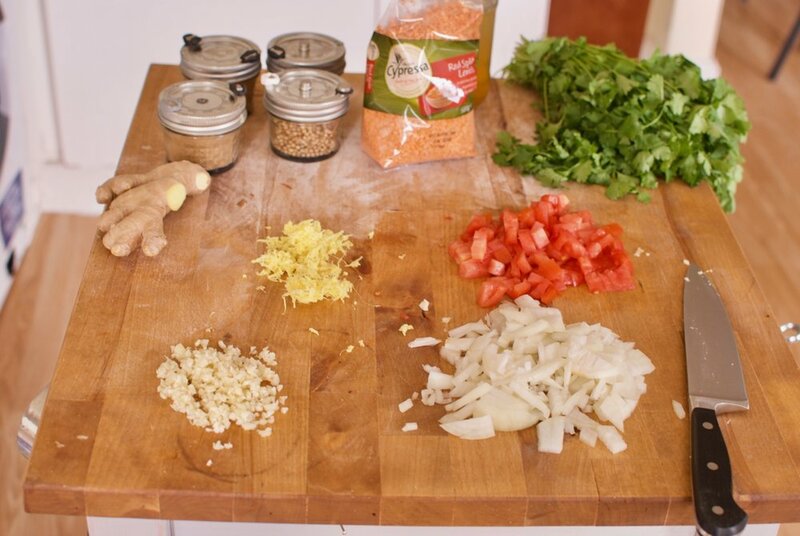 Chop and grate the onion, garlic, ginger and tomatoes. Heat up some ghee or canola oil in a heavy bottom pan. Add the onion, garlic and ginger, and stir until all are translucent. Add the spices and stir. Add the tomatoes and cook down for 5 minutes or so. Add the lentils and the stock. Stir. Bring to a boil, turn heat to low and cover with a heavy lid. Simmer for 30 minutes or so, or until the lentils have cooked down and become creamy. Remove from heat. You can add coconut milk or yogurt here, or not. Take a hand blender and blend a third of the mixture. Stir again.